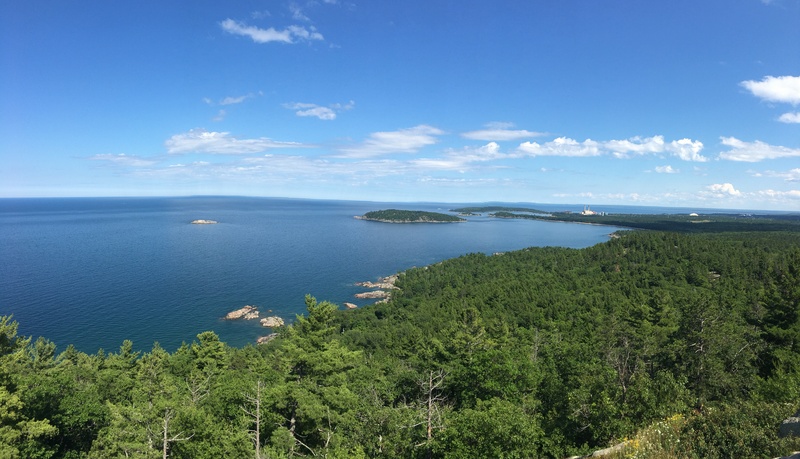 Marquette MI – Let's Go RVing! Left Tiki RV Park just before 10:00 and the first leg of our journey further into the UP followed the scenically Straits of Mackinaw, then the beautiful Lake Michigan. When you could see through the trees the view was spectacular. Michigan is surely a pretty state with abundant trees, lush grasses and beautiful lakes, many more than just the five famous ones. The weather is perfect today, 60 degrees with a cool breeze. Not a good day to be leaving this lovely area but headed to Marquette and then touring Munising tomorrow. I have heard a number of people talk about the bad roads in Michigan but so far we’ve haven’t seen any. 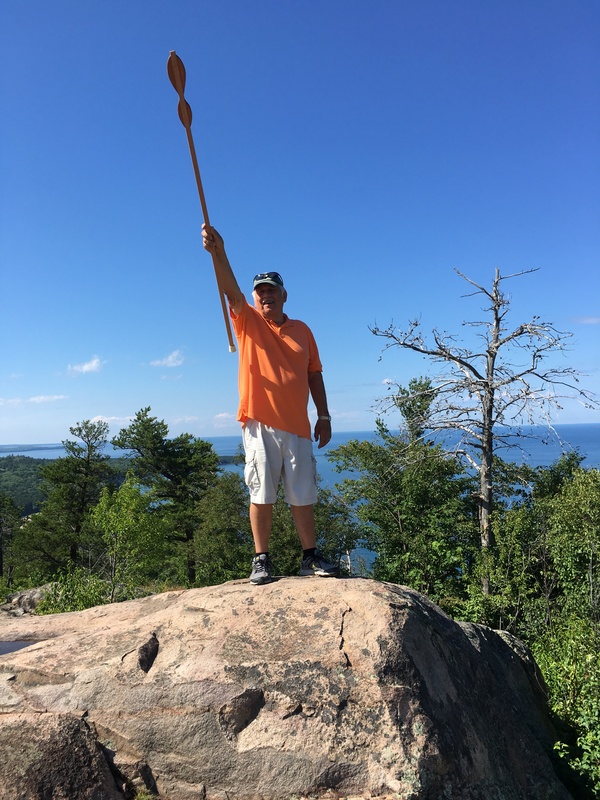 The trip to Marquette was a smooth road and uneventful, the kind we like! As the first leg of the trip followed Lake Michigan coastline the last 30 miles or so followed the Lake Superior coastline. We stopped at an overlook when we got our first glance. The breeze was brisk and it was a bit cool but there were people in the water! Unbelievable for this southern girl. We are staying at the city park which is all the way on the other side of town and we had to maneuver around some road construction. One thing I can say for sure is that Eastern United States is working on their highways as we have run into many construction sites! Sometimes that makes for interesting driving in a 40 foot motor home – and sometimes I just bow my head and pray! The park is nice, heavily treed with paved sites and the sites are a nice size. Wi-Fi seems to work well for a change but we can’t get a Dish signal. That’s OK since we rarely watch TV when we’re traveling. After we got set up we ate a quick lunch and decided to go find Sugarloaf Mountain, one of the most popular overlooks on the UP. 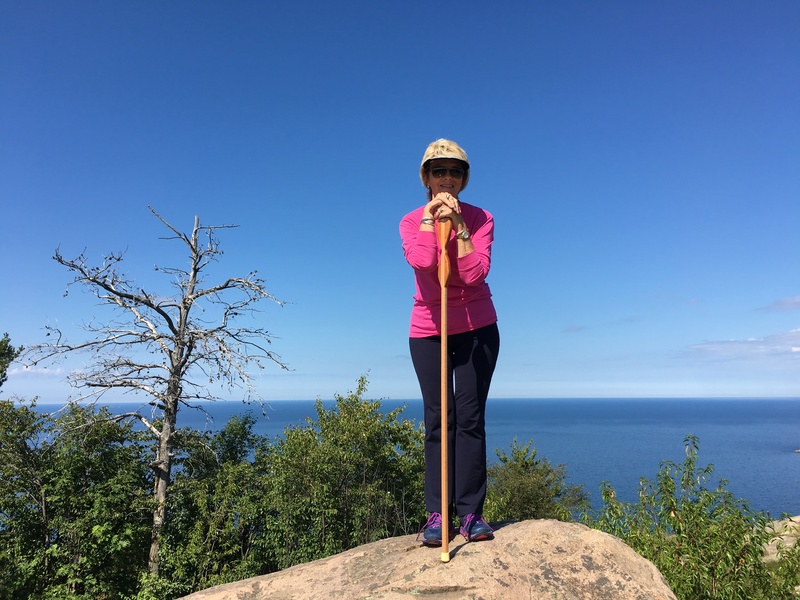 There are two trails leading up to the Lake Superior overlook, one marked easy and one marked difficult. With our walking sticks in hand we headed out – on the easy trail however I think about half way up we ended up on the difficult trail. The trail consisted of both a walking path and some steep stairway segments. There are three platforms but the center one offers the most panoramic view of Lake Superior. It is stunningly beautiful and so very vast, the largest of the Great Lakes and the largest freshwater lake in the world. It was an easy hike and took us about 20 minutes to walk up and then 20 to get down. We came back to the campground and started with dinner so we could get a bike ride in tonight. Marquette is certainly a bike/walker friendly town and after riding around the campground for a while we found the bike trail and that was fun and we didn’t have to dodge nearly so many people! At one point we had to cross a busy four lane street that had a clearly marked stopping point for cars so that bikes could cross over and —- the cars stopped for us!